Rhode Island Fishing Charters on the Adventure in Jerusalem. 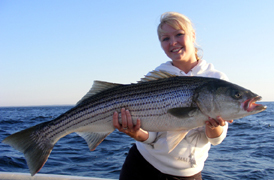 Rhode Island Fishing Charters on the Adventure. 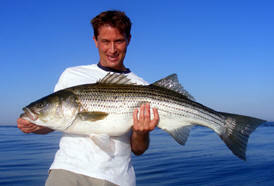 We offer charters for Families, beginners, and also the serious, dedicated anglers. Adventure offers light tackle and fly fishing on our 25' Rienell. Our 33' diesel-powered Webber Cove is perfect for families and large groups. We fish for a variety of species, including Fluke (aka Fluke), Striped Bass, Bluefish, Tuna, Tautog, Sea Bass, and others. Check out the latest photos on our website. Rhode Island fishing charters sailing from Jim's Dock in Jerusalem.